* Easter Flower Memorial Offering: In the Catholic Church, Easter is the greatest feast day of the year, the time that we celebrate the glorious resurrection of our Lord. And it is also a fitting time to remember our departed ones, for whom we pray to be resurrected into a glorious life with our Lord in heaven. 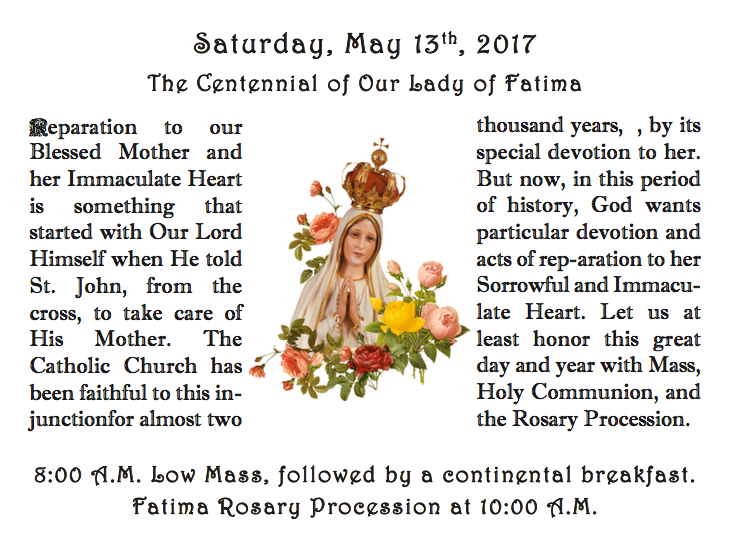 Thus, it is a pious observance in this parish to offer a flower memorial donation at Easter in memory of our departed loved ones. Easter Flower envelopes are available in the pews and in the vestibule. Please put them in the offering basket on Palm Sunday, April 14th, 2019. 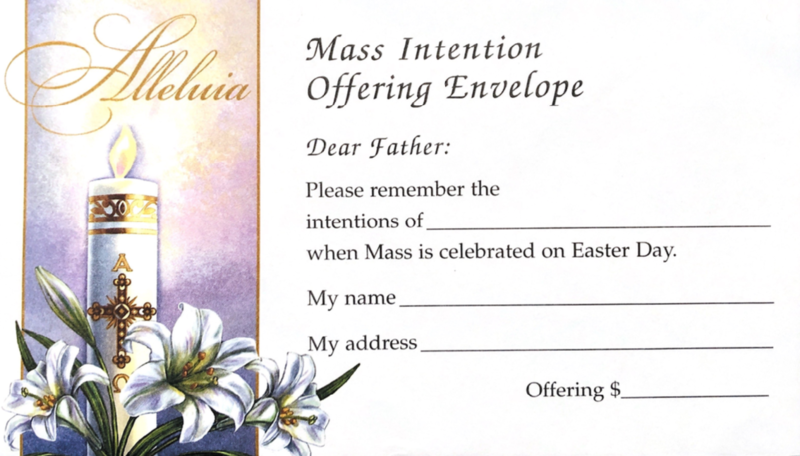 * Easter Sunday Mass Intention Envelope: You will find an envelope in the vestibule in which you may enclose intentions for your loved ones in the Easter Octave Masses. This intention does not require the regular Mass stipend offering; for this stipend, you are welcome to give an offering as little as $1.00. 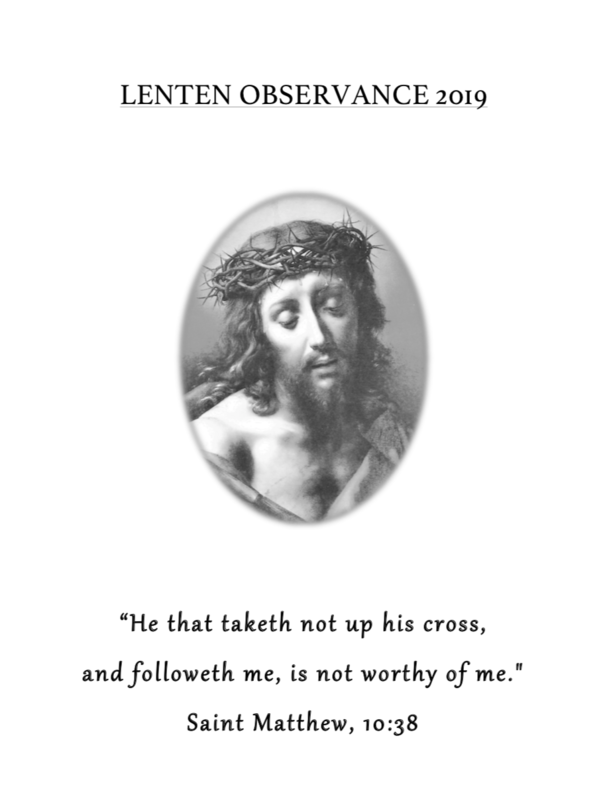 Please put your intentions in the offering basket on Palm Sunday, April 14th, 2019. We are glad that you have chosen to visit our website. 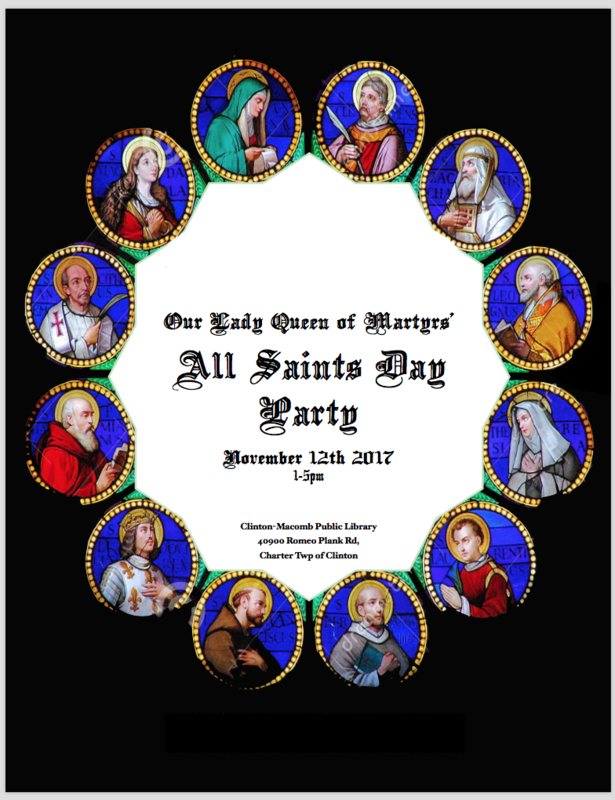 The clergy and parishioners of Our Lady Queen of Martyrs Church reject the changes of Vatican II. They uphold the Roman Catholic Faith by maintaining everything which was taught and done by the Church prior to Vatican II. Sermon: Fifty Years of Vatican II, by Bp. Sanborn. (This is a link to MHTS Page). In order to receive the sacraments here, it is, therefore, necessary that you attend exclusively the traditional Latin Mass, VIDEO LINK https://www.youtube.com/watch? and avoid the new Mass and reformed sacraments. Conference: Why to Recognize and Resist is not Catholic, by Bp. 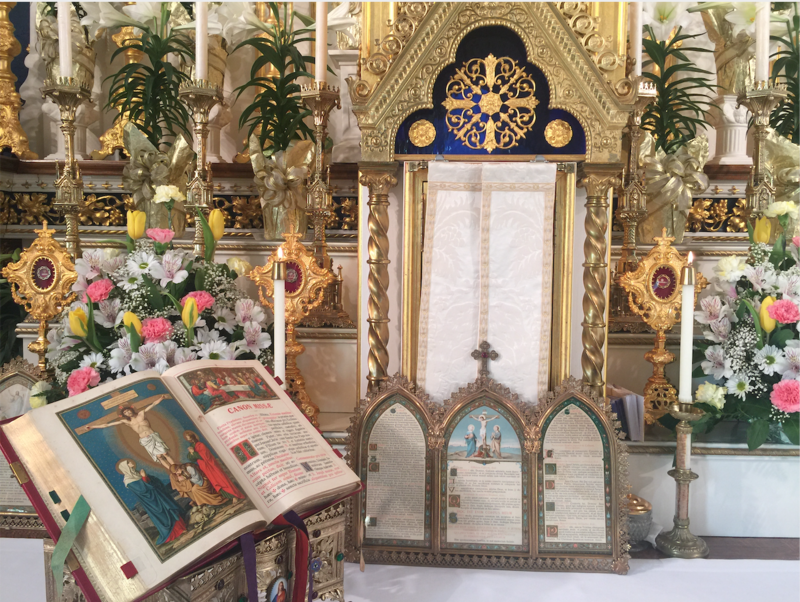 Sanborn We invite you to visit us and to take free of charge the booklets entitled Welcome to the Traditional Latin Mass and Traditionalists, Infallibility and the Pope, which are very informative. These booklets can be found on the counter near the main entrance to the building. Please take them with you and read them thoroughly. 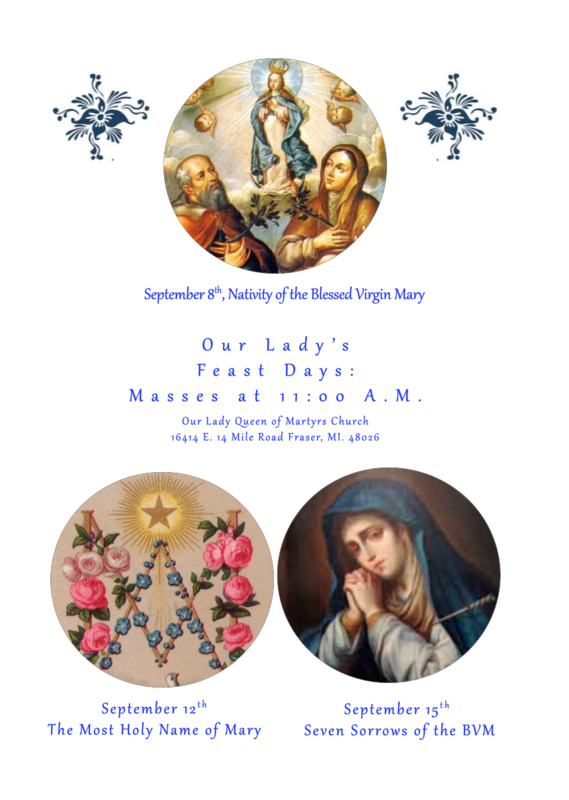 If you are contemplating adherence to Catholic Tradition, we invite you to join us for Holy Mass on Sunday and to speak afterward with the clergy, who would be happy to answer any questions that you might have. 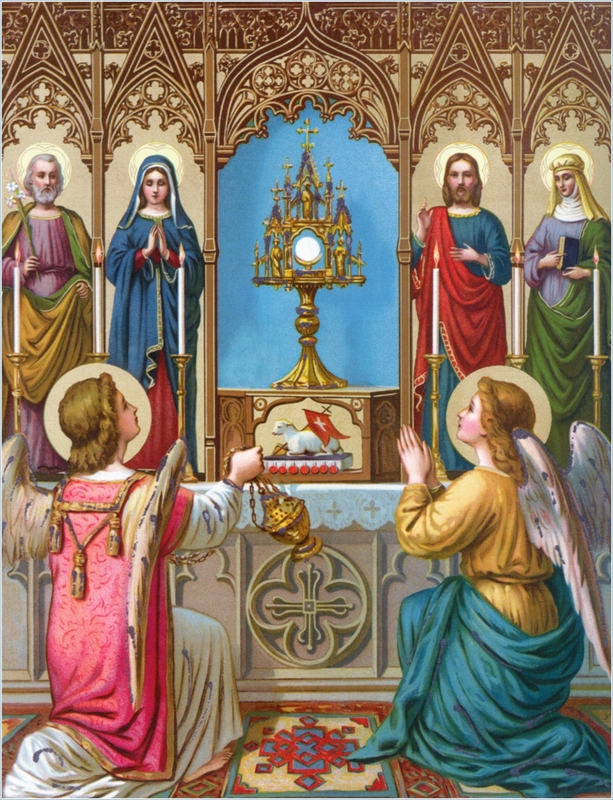 We ask only that you refrain from receiving Holy Communion until you have made the decision to attend exclusively the traditional Latin Mass and to avoid the new Mass and reformed sacraments. Sermon: One Lord, One Faith, One Baptism, by Bp. Sanborn (This is a link to MHTS page). The Assumption of the BVM. The Immaculate Conception of the BVM. Christmas, the Nativity of Our Lord. 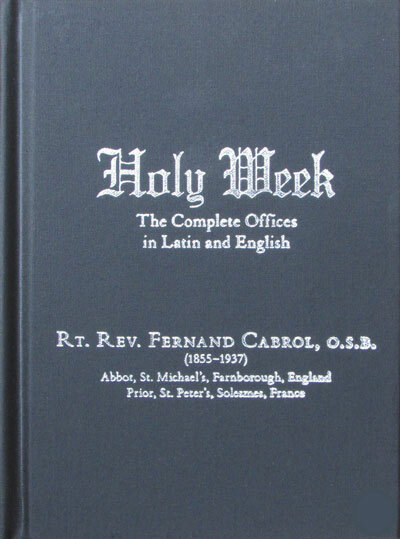 This veritable handbook of the Roman Liturgy for the so-called "Great Week" or Holy Week, commemorating the chief historical events in the Christian narrative of the redemptive passion and death of Jesus Christ, consolidates the "unreconstructed" liturgical texts from the Roman Missal and Roman Breviary from before the reforms of the early 1950s. 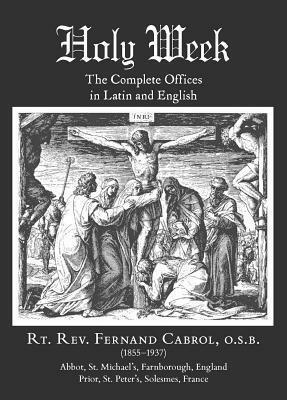 Abbot Cabrol, an early 20th-century liturgist, renders the liturgical texts in the vernacular with notable grace and clarity, while his historical and theological commentaries add context and meaning to these most venerable and antiquated of all rites within the Roman Catholic liturgy. Abbot Cabrol (1855–1937) made his vows as a Benedictine in 1877 at Solesmes, was ordained a priest in 1882, and served as Prior there beginning in 1890. In 1896 he became the first Prior of St. Michael's in Farnborough, England, a daughter house of the Solemses Abbey, and, when the former was raised to an Abbey in 1903, Cabrol became its first Abbot. He authored some dozen books on the liturgy and liturgical history, and his research and study in France, Italy, Switzerland, and Germany contributed to La Paleógraphie Musicale. He was awarded the Order of the British Empire in 1920 for his work witht he Red Cross during World War I. The laws of fast apply to persons between the ages of twenty-one and fifty-nine. On a fast day, one may eat only one full meal and two light meatless meals, which together would not equal the main meal. Meat may be taken only at the principal meal, except on days of complete abstinence. Liquids such as water, milk, and fruit juices may be taken between meals. The laws of abstinence apply to everyone seven years of age and over. On a day of complete abstinence no meat, meat gravy, or soup made from meat may be taken. On a day of partial abstinence meat may be taken once.abstinence meat may be taken once. All the days of Lent up till noon on Holy Saturday; the Ember Days; and the Vigils of Pentecost, the Immaculate Conception, Christmas, and All Saints. Every Friday of the year, Ash Wednesday, Holy Saturday (until noon), the Vigils of All Saints, the Immaculate Conception, and Christmas. Ember Wednesdays and Saturdays and the Vigil of Pentecost. 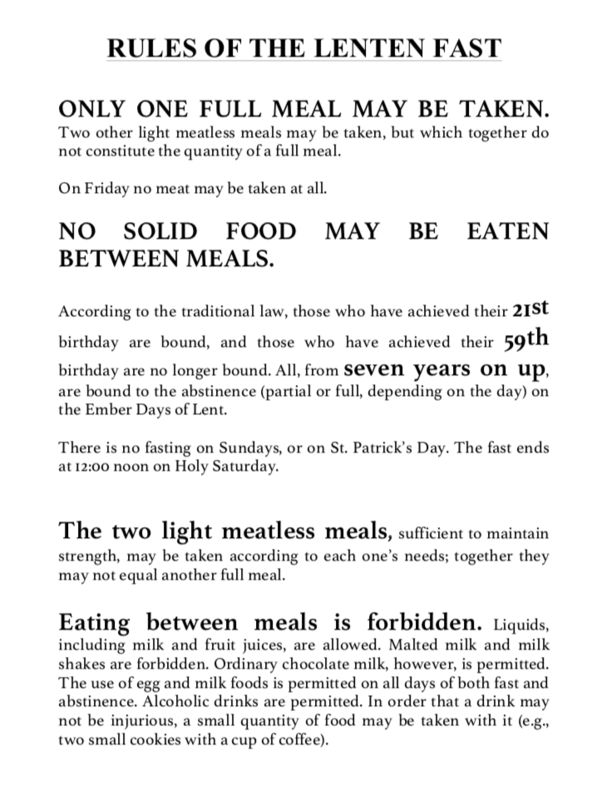 In many places in the United States before Vatican II, it was customary to dispense from the fast on St. Patrick's Day (March 17) and from abstinence on the Friday following Thanksgiving. 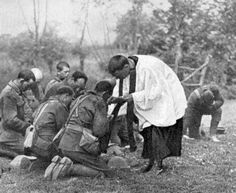 *At the traditional Mass, the communicant does not respond "Amen"
New Zealand troops taking Holy Communion administered by an Army chaplain in the open air. (a) Just as it is necessary to nourish our bodies with material food, so also it is necessary to nourish our souls with spiritual food. Our Divine Saviour so loved us that He gave us Himself in the sacrament of the Holy Eucharist; He gave us His own body and blood as food for our souls. (b) It is not necessary that we receive Our Lord’s body and blood under the appearances of both bread and wine. Christ is entirely present under the appearances of bread, and also entirely present under the appearances of wine. Therefore, we receive Him whole and entire under the appearances of bread alone or of wine alone. (c) In some Eastern Churches the faithful receive Holy Communion under the appearances of both bread and wine. In the Western Church the faithful receive Communion only under the appearances of bread. To receive Holy Communion worthily it is necessary to be free from mortal sin, to have a right intention, and to obey the Church's laws on the fast required before Holy Communion out of reverence for the body and blood of Our Divine Lord. However, there are some cases in which Holy Communion may be received without fasting. He who knowingly receives Holy Communion in mortal sin receives the body and blood of Christ; but he does not receive His graces and he commits a grave sin of sacrilege. 370. Does the Church now command us to fast from midnight before Holy Communion? The Church does not now command us to fast from midnight before Holy Communion, as it did formerly. The laws enacted by Pope Pius XII now regulate this matter by the number of hours we must fast. 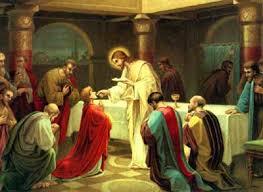 (a) For many centuries the Church commanded a strict fast from midnight before one could receive Holy Communion. 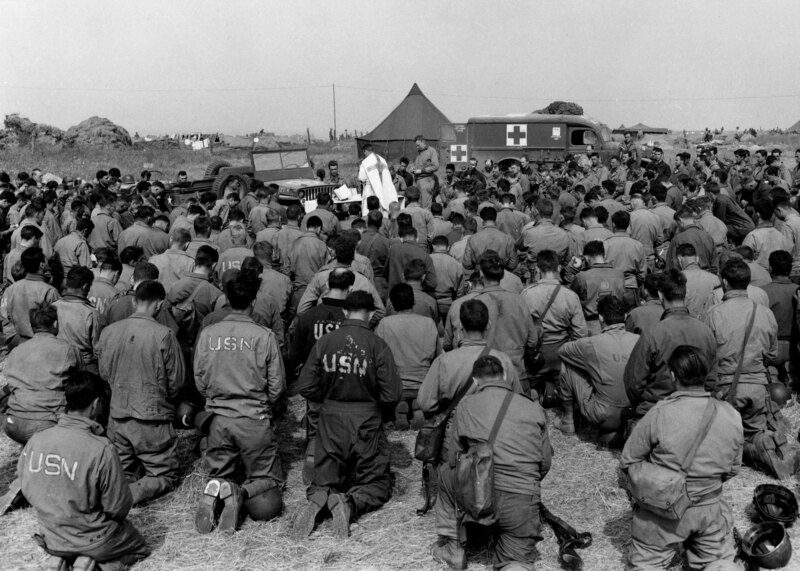 However, in 1953 Pope Pius XII introduced a much more lenient form of fasting before Holy Communion, and in 1957 the same Pope granted greater concessions, in order to give Catholics an opportunity to receive Holy Communion more frequently. 372. What are the laws enacted by Pope Pius XII regarding the fast required before Holy Communion? Water may be taken at any time before Holy Communion without breaking the fast. Sick persons, though not confined to bed, may receive Holy Communion after taking medicine or nonalcoholic drinks. A priest's permission is not necessary. All Catholics may receive Holy Communion after fasting three hours from food and alcoholic drinks and one hour from non-alcoholic drinks. 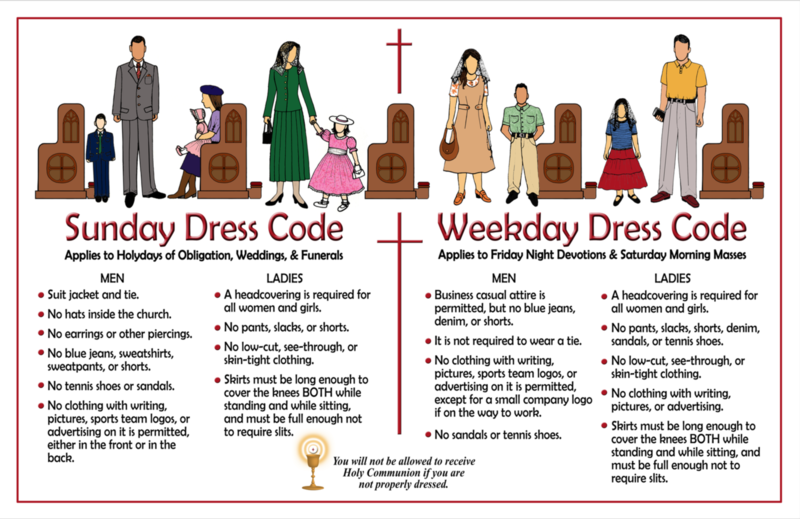 This applies to Holy Communion at midnight Mass as well as at Masses celebrated in the morning, afternoon, or evening. A priest’s permission is not necessary. Catholics are urged to observe the Eucharistic fast from midnight as formerly, and also to compensate for the use of the new privileges by works of charity and penance; but these practices are not obligatory. 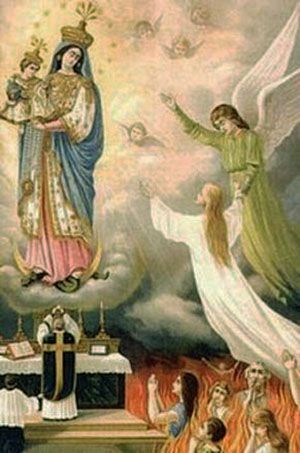 Finally, one who has already received Holy Communion may not receive the Blessed Sacrament again on the same day except in danger of death. and followeth me, is not worthy of me." Only one full meal may be taken. Two other light meatless meals may be taken, but which together do not constitute the quantity of a full meal. On Friday no meat may be taken at all. No solid food may be eaten between meals. According to the traditional law, those who have achieved their 21st birthday are bound, and those who have achieved their 59th birthday are no longer bound. All, from seven years on up, are bound to the abstinence (partial or full, depending on the day) on the Ember Days of Lent. There is no fasting on Sundays, or on St. Patrick’s Day. The fast ends at 12:00 noon on Holy Saturday. The two light meatless meals, sufficient to maintain strength, may be taken according to each one’s needs; together they may not equal another full meal. Eating between meals is forbidden. Liquids, including milk and fruit juices, are allowed. Malted milk and milk shakes are forbidden. Ordinary chocolate milk, however, is permitted. The use of egg and milk foods is permitted on all days of both fast and abstinence. Alcoholic drinks are permitted. In order that a drink may not be injurious, a small quantity of food may be taken with it (e.g., two small cookies with a cup of coffee). When health or the ability to work would be seriously affected, the law does not oblige. One who is not obliged to fast may eat meat as often as he wills on days when fasting alone is prescribed. In Lent, there is a special law of abstinence, apart from that of the fast, on the following days: Ash Wednesday, the Ember Days, and Fridays. This law of abstinence applies to all from age seven until death. To interrupt the principal meal for more than a half an hour without reason would be a venial sin; should the interruption last more than one hour — without reason — it would constitute a mortal sin. In determining the amount which one may take at the light meals, the following things must be considered: a person’s physical constitution, the kind of work he does, the length of the fast, and the severity of the climate. In general, a person may eat enough to enable him to do his work well and to continue the fast without considerable detriment to himself. If one — deliberately or by mistake — has eaten two full meals on a fast day, one can no longer observe the fast and therefore may eat to satiety again. Soup with meat stocks or gravies made from meat are forbidden whenever one must abstain from meat. (In restaurants, always ask if the soup has a meat stock). He who has once eaten meat on a day of abstinence may still observe the law, and is therefore not free to eat meat again that day. 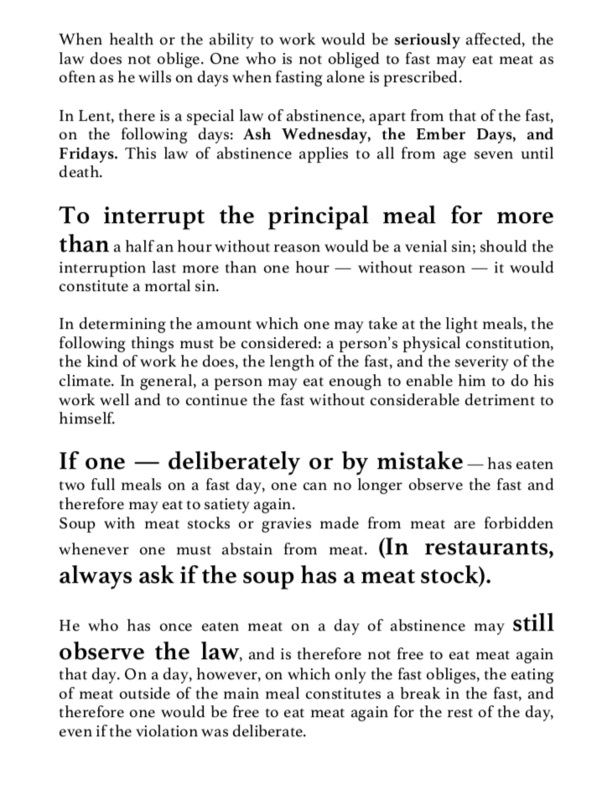 On a day, however, on which only the fast obliges, the eating of meat outside of the main meal constitutes a break in the fast, and therefore one would be free to eat meat again for the rest of the day, even if the violation was deliberate. The laws of fast and abstinence have been always binding under grave sin. However they do admit of slight violations, which are only venial. It would not be mortally sinful to eat, for example, two ounces of food outside of the meal times. More than four ounces (total during the day) would constitute grave matter. Two ounces of meat would constitute a grave violation of the abstinence law. 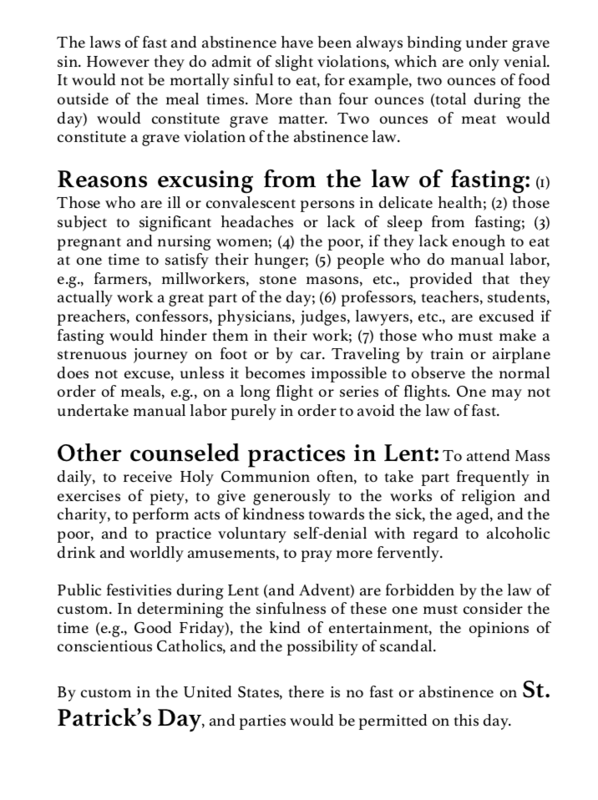 Reasons excusing from the law of fasting: (1) Those who are ill or convalescent persons in delicate health; (2) those subject to significant headaches or lack of sleep from fasting; (3) pregnant and nursing women; (4) the poor, if they lack enough to eat at one time to satisfy their hunger; (5) people who do manual labor, e.g., farmers, millworkers, stone masons, etc., provided that they actually work a great part of the day; (6) professors, teachers, students, preachers, confessors, physicians, judges, lawyers, etc., are excused if fasting would hinder them in their work; (7) those who must make a strenuous journey on foot or by car. Traveling by train or airplane does not excuse, unless it becomes impossible to observe the normal order of meals, e.g., on a long flight or series of flights. One may not undertake manual labor purely in order to avoid the law of fast. Other counseled practices in Lent: To attend Mass daily, to receive Holy Communion often, to take part frequently in exercises of piety, to give generously to the works of religion and charity, to perform acts of kindness towards the sick, the aged, and the poor, and to practice voluntary self-denial with regard to alcoholic drink and worldly amusements, to pray more fervently. Public festivities during Lent (and Advent) are forbidden by the law of custom. 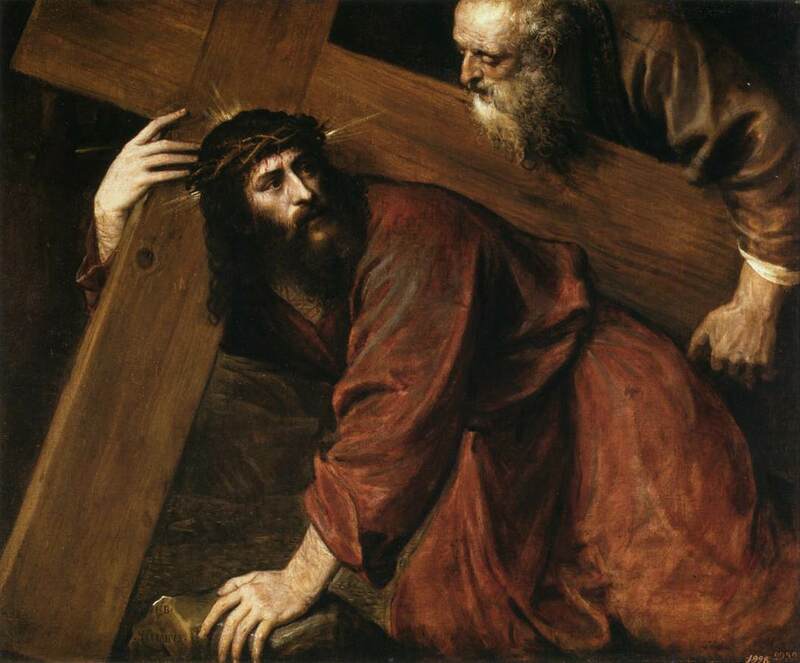 In determining the sinfulness of these one must consider the time (e.g., Good Friday), the kind of entertainment, the opinions of conscientious Catholics, and the possibility of scandal. By custom in the United States, there is no fast or abstinence on St. Patrick’s Day, and parties would be permitted on this day. Once a month a Requiem Low Mass is offered for the Faithful departed enrolled in the OLQM Purgatorial Society. 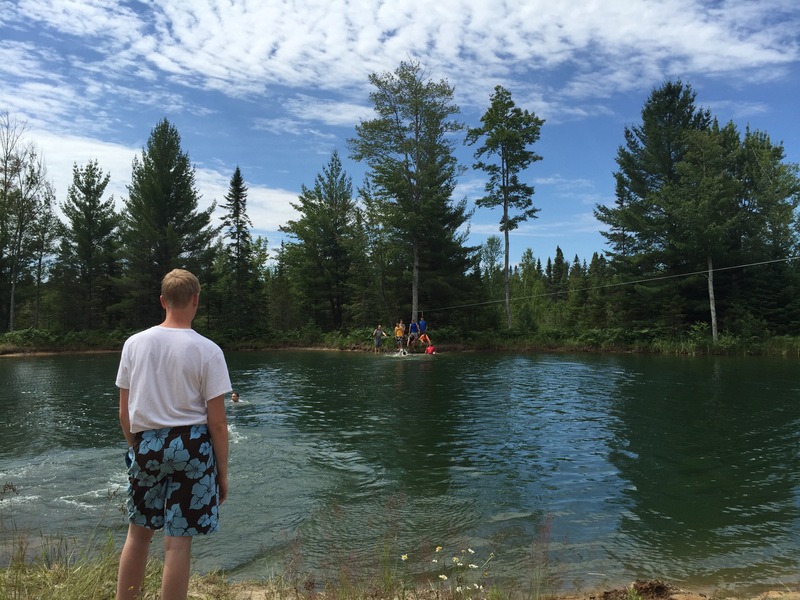 Please register at http://www.olqmfraser.org/site/contact_us.php by June 25th. 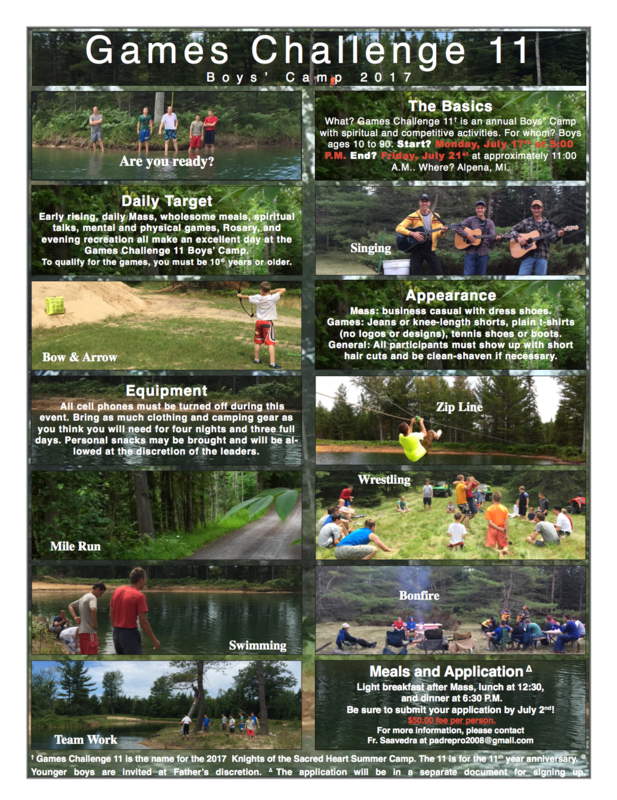 Fill out all fields, and in the Comments box, please state Boys Camp and list the names and ages of the boys who will be attending. The required Release Form is due by July 2nd. For the Release Form, click on the link at the bottom of this announcement. To participate, the Release Form MUST be turned in by July 2nd. Please send it back no later than July 2nd, 2017.